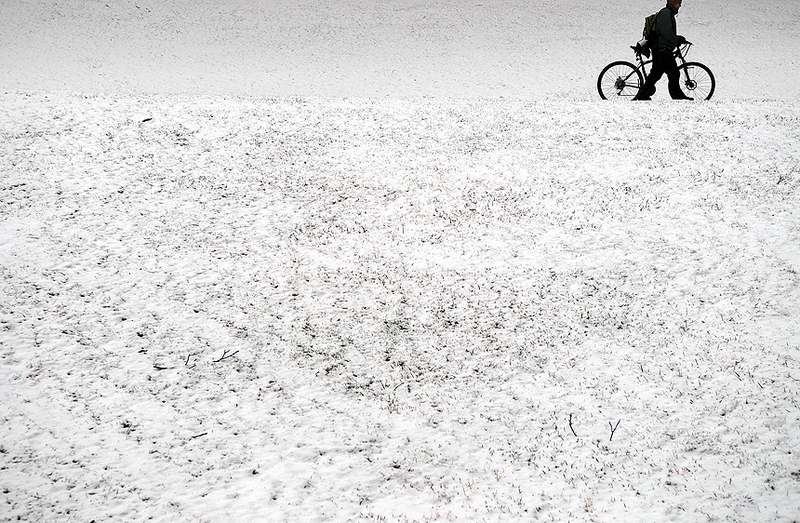 "A light snow blanketed everything but cement surfaces on campus Wednesday afternoon. The snow was not enough to cancel classes, and more winter precipitation is expected Thursday night into Friday, according to the National Weather Service." Wednesday has been the slowest day of the year. I don't have classes on Wednesday, but I do have production for The Towerlight. From the moment I woke up, I knew it would be a dull day. I started my day shooting a restaurant review and that would be the highlight of my day. Depressing, right? The real reason my day was such a drag was because of the visual we used on the cover. Now, I am not one to chop liver, and I easily get along with everyone, but recent ideas pitched for visuals has been driving me a bit insane. For tomorrow, the cover story is about the debate of whether or not students should be allowed to carry concealed handguns on college campus' for protection in lieu of recent college shootings, including Virgina Tech and Northern Illinois University. While some wanted a cutout, I wanted a human angle. As I said yesterday, illustrations, although necessary at times, are meaningless in my opinion. Any article, no matter how boring, will always be more meaningful and interesting to the reader if they can relate a the story with a human. Even if a illustration is called for, it should at least include relevant statistics relating to the story. Cutting out a photo and slapping it haphazardly on the page does not make a reader want to pick up the paper. For this story, I pitched the idea to find students who already practice safe (or unsafe) gun control. For example, go to the gun range with them, or go to the gun range and get a detailed photo of a certified instructor firing a handgun properly. Possibly find students in a gun club or anti-gun club on campus. These were only a few of my suggestions. So last night, although I fought and fought to get a human angle to the art on the front page, we were still left with no photo assignment for cover Wednesday on deadline. To my dismay, and at 6:00 p.m., I complied to shoot a fake gun. It's frustrating to me when we run a cutout, it's a photo that anyone would could take. I would much rather run a compelling photo rather than cutout with a story. Week after week I pitch my ideas for what makes the better art, that tells the story, rather than what may always be listed on the assignment. Cutouts simply don't do justice. Am I wrong here? Nonetheless, the cover looked good since we went a step beyond just putting a cutout gun on the cover. We listed facts and changed the type to help grab the readers attention. But I was still upset with my day, I didn't have any other assignments and there was no room in the paper for a snow feature. Knowing that, I just wanted to clear my mind by shooting. However, my above snow feature was all I could find worth posting for the day since I limited myself to campus. Ugh. Ehh, I guess this is my bad day of the month. Tomorrow is only a day away. Well, that ends my rant. My freelance assignment tonight was canceled because of the light snow, which is OK with me. It will give me a little time to catch up on some school work and possibly catch a glimpse of the Lunar Eclipse. I think that producing a newspaper combines far more disciplines than most activities. The editor of a paper must be sympathetic to written words while considering length and balance in the whole paper; to the suitability of the subediting; to the newsworthynesss of the piece; to the presentation, the design and to the photographs. This range of considerations is uniquely broad and getting it right is the hallmark of a good editor-in-chief. And you realise how difficult that is when you see people who are sorely lacking in one (or more) of those fields. I've had section editors who are completely oblivious to the stories that lend themselves to good visuals while suggesting only the absolute dullest stories. So this is why we have different people for different jobs in newspapers. And I must say, in between the moments I'm pulling my hair out, I find that the pressure to balance so many different people's priorities actually encourages and drives my creativity far more than simply shooting for myself. Patrick - I agree with the idea that the human angle generally is more compelling. Strong graphics can be eye-catching and help tell the story, too. I think cutouts appeal to graphic designers in part because they are so elemental, with the trade-off being that they end up lacking depth or engaging anything more than a 1/4-second look. The balancing act belongs to the editor, and without good editing and graphic design, that balance is going to be wrong. Ah, well.